Fidel Gastro and Tuxedos and T-shirts took over Mercury Espresso Bar last Thursday, slinging sandwiches and sticky toffee pudding to a steady stream of Leslieville customers from 6-9pm . An assortment of blaring tunes which spanned from the Strange Boys and Mos Def contributed to the high-octane energy which had some Mercury regulars befuddled as they strolled by for their afternoon drink and were met by a wall of sound and shouts of "Ole! Ole!". Matthew Basile, the creator and chef behind Fidel Gastro has branded his Pop-up food enterprise with the slogan "Rebel without a Kitchen". 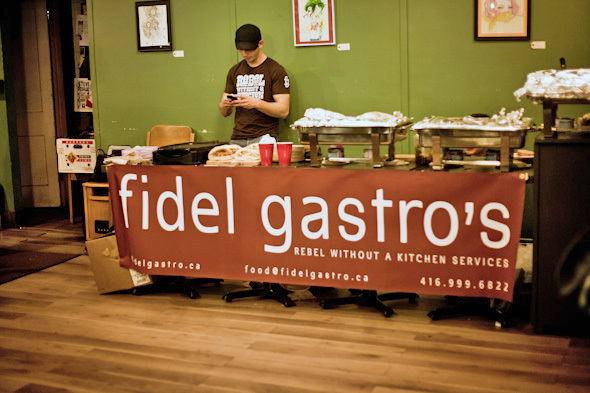 His red and white flag with the Fidel Gastro logo hung outside the entrance to signify his territorial conquest of the little corner of Queen East and Morse, if only for an evening. The wait time was kept to a minimum as Matthew and his band of merry rebels assembled the sandwiches from foil covered trays, used a sandwich iron to grill them and happily passed them on to the continuous queue along the west wall of this espresso shop. There were three sandwich choices: The Havana Club, the Olé, Olé, Olé! (Poutine and bacon), the Cuban Mac (Mac and cheese with chorizo sausage). 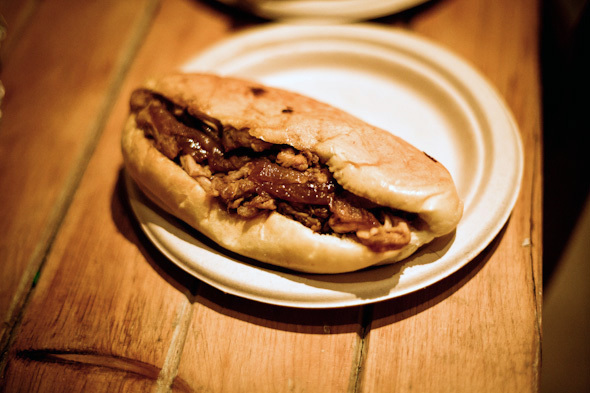 For $10, we got two sandwiches, plus a sticky toffee pudding for dessert. Mercury staff were serving $3 espresso and cortados and $2 French Press coffee. The Havana Club was a winner. 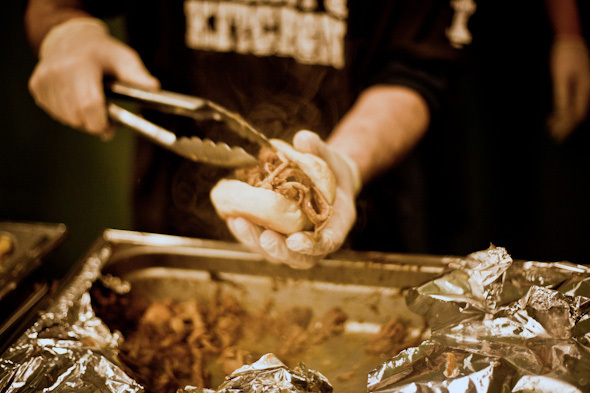 Chewy pulled pork, slices of ham, Havarti and sweet caramelized onion held a flavor riot on a white chewy bun. While the components of this sandwich were basic, the pork marinated in beer and the caramelized onions added great malty sweetness to this sandwich. While the Cuban Mac gets points for being innovative, the penne and cheese filling was too gummy and indistinguishable against the similarly squashy bun. Sharper cheese choices and chunkier chorizo perhaps could remedy the situation. 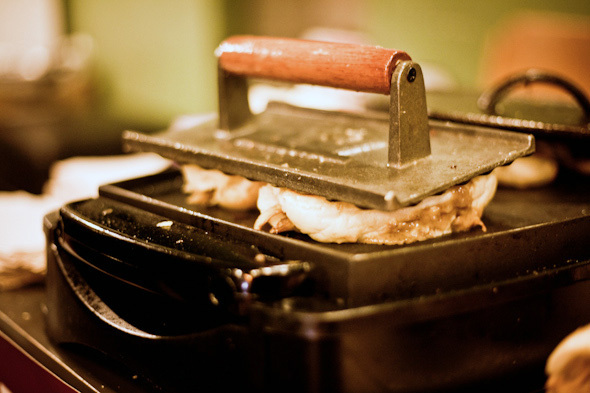 Poutine on a sandwich was a recognizable flavor in an unfamiliar setting. I'm almost certain that there is a secret competition among chefs in Canada's capital cities to create as many variations on poutine as are humanly possible. In this case, the bacon and starchiness of the fries created a heavy, mouth-filling flavor, to which the grilled bun was a crunchy contrast. The short-rib gravy added necessary moisture and flavor to this sandwich. 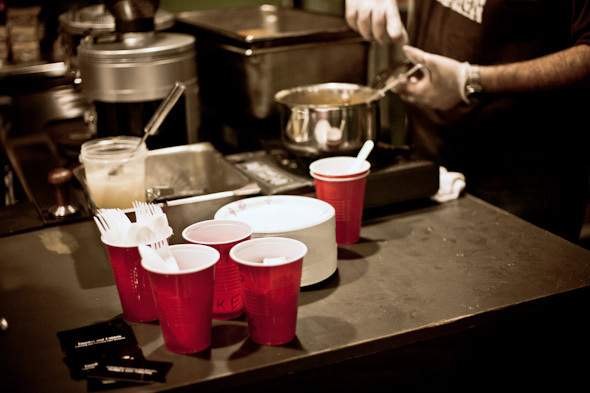 Dessert was conceptualized and served by Steve Shienfield, the owner and executive chef of Tuxedos and T-shirts. 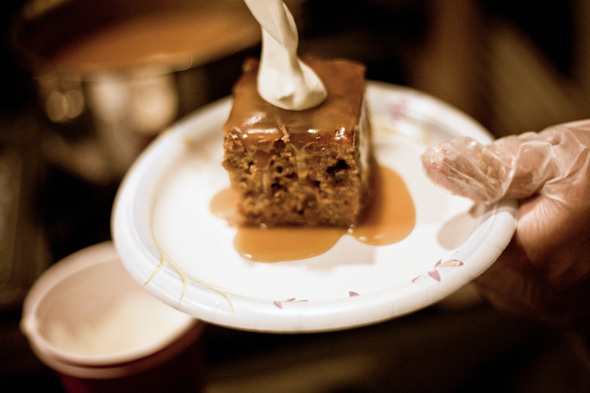 His sticky toffee pudding was a squashy chunk of caramel-colored cake, served warm on a paper plate with a dollop of whipped cream. An absolute perfect blend of soggy, sweet pudding, with crispy edges and thick, caramel sauce: this was a delightful variation on the salty and sugary cliché that always seems to work. The momentary realization that I could never return to this exact place and order it again made every bite a little bit sweeter.